Life at my house has been a tad bit hectic lately so today’s tutorial will be a quick-and-easy one. I don’t know about you but I just love Connie Prince‘s collections. 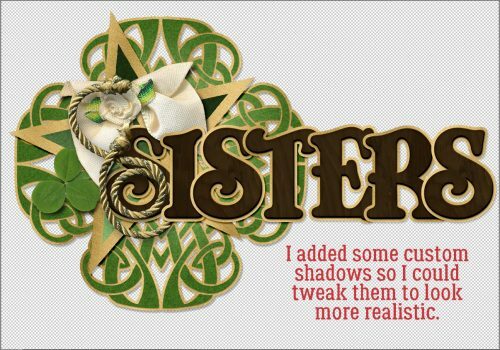 She often includes some absolutely fabulous clustered word art titles, and she ALWAYS includes at least one alpha set. Her new collection, My Lucky Stars, is no exception. There are six clustered titles in the bundle… but what if none of the included titles really works for your layout? Well, it’s not difficult to make your own. I don’t know how Connie does it, but I’ll show you how Jan does! I start with a new project workspace of roughly the size of the area I want to cover with my title cluster. 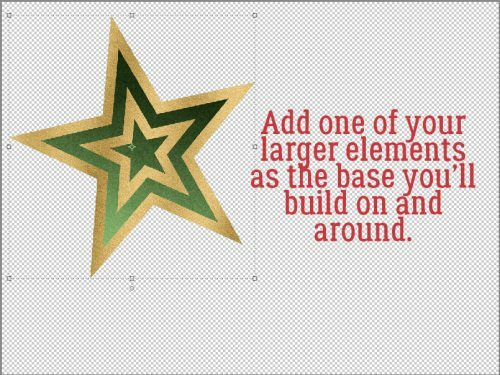 I like to start by placing one of the larger elements I plan to use into my space and moving it around a smidge. That will form the base for placement of everything else. Then I usually add in my alpha. I’ve already decided what my title will say, and copied the various letters into my layout folder. As you can see, my title for this layout is “Sisters”. Make sure your letters are in the correct order! Then resize them all as a group. Guestimate how much space they’re going to take on your canvas. Getting the size right isn’t always immediate. I adjusted mine a couple of times before I used the Distribute tool. This is similar to the Align tool. It simply moves everything between two spaces as I’ve shown you below and distributes them based on what parameter you choose. I went with Distribute>Middle. You could choose the right edge or the left edge depending on the look you’re after. As you can see below, I didn’t get the size right even after I resized a couple of times. So I resized, moved the last S over to the right edge again and Redistributed until I had enough space to read what my title says. There were a couple of letters that I needed to nudge individually because the algorithm the software uses to determine the middle of a letter doesn’t account for skinny letters like I or wide letters like W.
Once I had the letters arranged the way I wanted them, I added more of my elements onto the workspace. Layer them in a way that makes sense to you and for your layout. I usually have some idea of how I plan to use the things I’ve chosen, but sometimes I get a happy little surprise. I moved the letters and string up a bit so all five points of the star were visible. 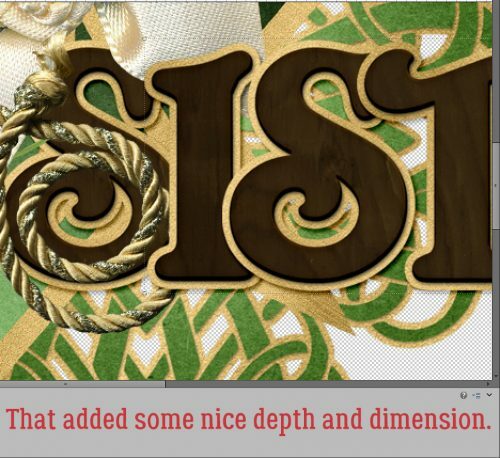 I tucked the bow in behind the I and a little on top of the first S.
I knew from the beginning that I’d be using one of the Celtic knots from the kit, but wasn’t sure where I was putting it. I decided it looked really nice behind everything else, so that’s where it went. 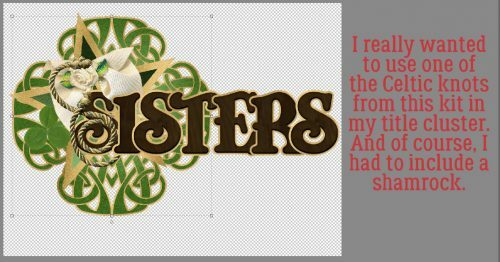 And since I was creating this layout on March 17th, I had to include a shamrock. Then came time to shadow everything. All the items in this type of cluster should be shadowed separately so they look right where they overlap once you move them onto your layout. I started with the first S in Sisters and used a shadow style for paper. Then I made some minor adjustments so it looked the way I wanted it. Can you see it in the screenshot? 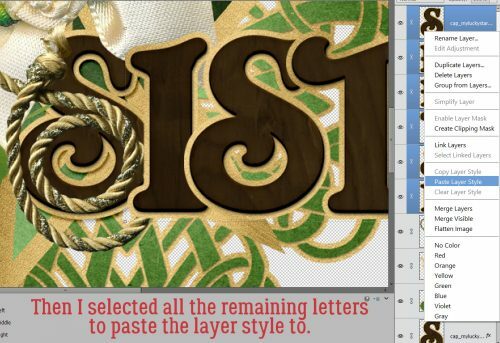 To use the same settings on all the letters I right-clicked on the first S layer in the Layers panel and selected Copy Layer Style. Then I selected all of the other alpha layers. 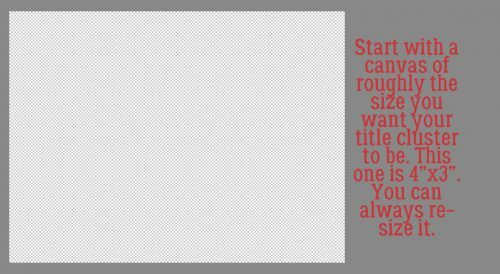 (If they’re on on top of the next, click on the first layer, hold down the shift key and then click on the last layer. If they’re staggered throughout the Layers panel, hold down the CTRL/CMD key and click on each one separately.) Right-click brings the layers menu back up and this time I chose Paste Layer Style. 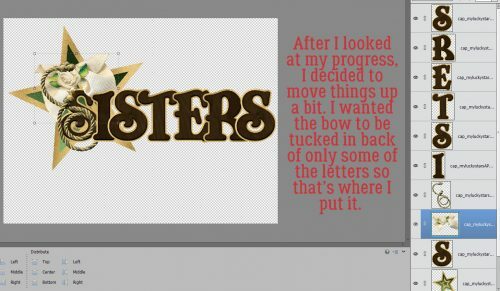 Now all the letters are shadowed and have definition and dimension. I made custom shadows for the string and the bow, bringing the shadow in close where the object touches what’s underneath it and pulling it away where things could be lifted off the paper. 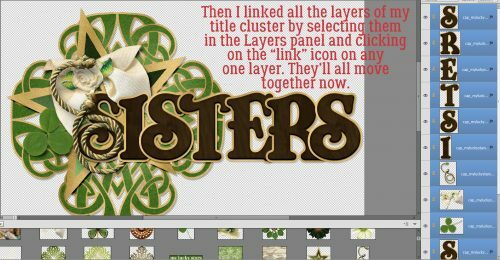 The last step is to link all the layers together so when I move the title cluster onto my layout, everything goes, and it all stays where I’ve put it. 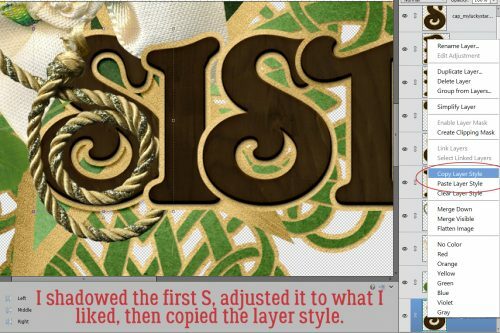 To link the layers, select them all as you did for shadowing multiple layers in one click. Click on the little link icon to the left of any one of the selected layers in the Layers panel and the links will turn yellow. That’s how you know the layers are linked together and will move together when the time comes. 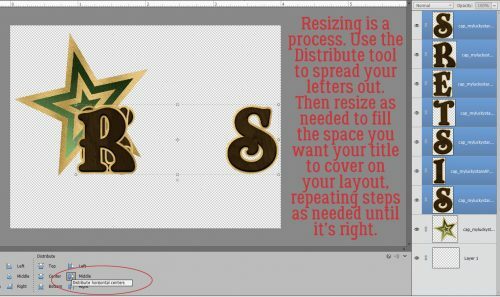 Once you’ve added your title cluster to your layout, look at it at several different magnifications to see if you need to add a drop shadow to the whole shebang. I found that mine looked better with an added shadow. 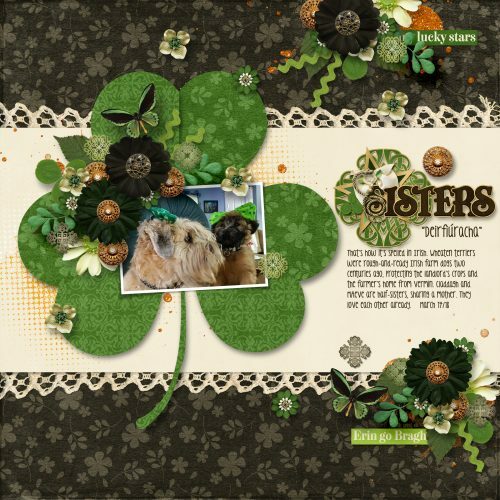 The finished layout is built on a template called My Lucky Charm from Heartstrings Scrap Art. That’s how Jan does it. Nothing to it! Lovely word art title, Jan! You make it all look so easy …. thanks for the tutorial!